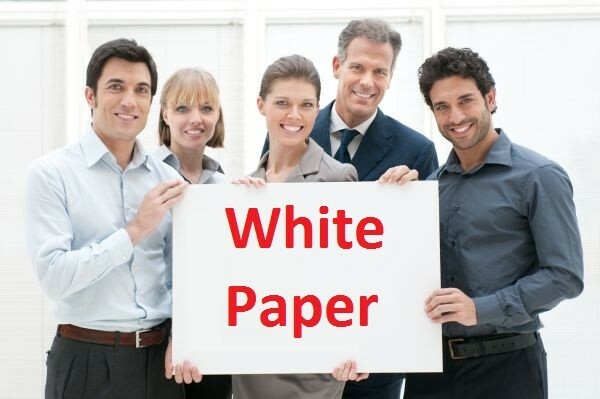 Would you like to learn how to create a white paper? First of all – what is a white paper? We have a lot of definitions and meanings of this phrase, but in this article we will concentrate only on commercial white papers. In simply words, it’s a comprehensive article about product or service, in which you will get some tips or benefits from using the product. It’s often used as a marketing tool for generating sales leads. As soon as you are handed the job of writing the white paper, you need to begin with a short interview. Interview the subject matter experts, product developers/service providers, and the marketing team and find out more about the company, the audience, the topic and collect content and marketing material the company has already produced. After this initial interview you can start reading. You can first start off by reading everything the company provided this could be brochures, white papers, blog posts, articles, annual reports, presentations, case studies, etc. While you read them take down notes of important points and anything you don’t understand. After reading the content provided by the company and its experts you can research and look for your own content. This can be on competitors’ websites, search engines, white paper distribution services, etc. After you finish reading this you can have your second round of interviews. In the second round of interviews, you can get all your doubts and questions cleared and you can also ask the experts to tell you about their ideas, opinions, views, etc. The reading and research you performed earlier will make it easy for you to follow the interviews better and ask specific questions. For more tips on performing the research you can read this post on Content Marketing Institute. Once you finish performing the research you can start creating the structure. Creating the structure will make it easy for you to write the white paper. First start off by analyzing all the notes and points you have taken down and then think about how you can put them together to create a white paper. The structure basically consists of a headline, followed by a sub-headline and an introduction. This introduction is followed by a problems section, a solutions section and a conclusion. Then it finally ends with the brochure section of the white paper. Now take a look at your notes and analyze it and filter it out carefully by selecting only the most relevant and useful parts. Check which one will fit into the white paper and its structure and discard the rest. This systematic process of creating a structure, will simplify the process of writing the white paper. These are the first parts of the white paper. You need to write persuasive and attention grabbing headlines and sub-headlines which will convince readers to read the rest of the white paper. The introduction needs to sum up the contents of the white paper. In the introduction you need to let your reader know why they should read the white paper, what can they learn from reading it, and how they can implement this knowledge. So focus on writing an introduction which lets your readers know, how they can use the information gained, if they white paper. The next two sections are the problems and solutions sections. You can either write these two sections together or you can write them separately. First you need to focus on writing the problems faced by your readers. While writing this, keep your audience in mind. Write about their problems and worries. After you discuss the problems in detail and write about how they are hindering their company’s growth, you can start writing the solutions section of the white paper, where you can give solutions to these problems. Here your aim needs to be to solve the problems and help your readers. After you finish writing the solutions in your white paper, you can write the conclusion, where you can sum up the contents of the white paper and give your reader a choice. You can let them know that they can either use the solutions in the white paper or they can use the services mentioned in the brochure below. Right after the conclusion, you need to write the brochure section of the white paper, where you write the benefits of hiring your company to solve your readers’ problems, in a very persuasive manner and end it with a powerful call to action. If you can write a really persuasive brochure section, you should be able to convert your readers into clients. If you follow all the above steps carefully, you should be able to write powerful white papers which can not only educate your readers, but can also help you generate leads. What steps do you follow while writing your white papers? Would you like to share your tips with us? Please leave your comments in the comments box below. Hi Mitt, thanks for your great tips! I enjoy reading posts that solve an problem or teach something new. I like the idea about writing a conclusion, some people might not fully get the post, so this will help others that did not pick up on it straight way. I have read an article at ProBlogger about White paper, but that wasn’t enough to convince me. This is really helpful article. Thanks for awesome post Mitt. Have a pleased day. Same article were posted at problogger but some changes you have made in it! Instead of Copy content. I liked It. Great efforts If you are trying to become a copyblogger then you must have to copyblogger. Nice blog design specially for Premium wordpress theme Genesis.